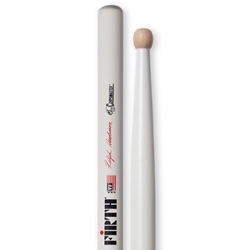 The Ralph Hardimon Signature Stick is one of the most widely used snare drum sticks in the modern marching activity. The SRH features a unique barrel tip and a long taper for quick rebound and added control. Ralph Hardimon is a percussionist, teacher, composer, and clinician. He is best known for his work in the areas of marching percussion, rudimental drumming, drum & bugle corps, and marching band.